Ireland centre Robbie Henshaw is set for a return to action in Connacht's final European pool fixture at the Galway Sportsground on Saturday (3pm ). Henshaw has been training for the last two weeks in the expectation of lining out in Saturday's Challenge Cup game against Russian visitors Enisei-STM, but he is still awaiting final clearance on his hand injury. "He will train all this week and prepare to play, and then we will need the final sign off from the surgeon tomorrow," says Connacht coach Pat Lam. Henshaw's return would be a timely boost for Connacht who need a shot in the arm after last weekend's "horrendous" performance against Brive, which Connacht lost to an injury-time penalty. While they still have a chance to qualify, they have lost any hopes of a home quarter-final. To finish as pool winners, Connacht, on 14 points, must win with a bonus point, and hope Brive, on 15 points, do not overcome Newcastle with a similar result. If both sides finish level on points, Connacht would advance by virtue of a superior points aggregate over the two matches. Connacht could also qualify as a pool runner-up, but that will depend on results in other pools, particularly pool three where Harlequins, already through, travel to Montpellier, and pool five where Grenoble host Edinburgh for the top spot. Those teams have superior points difference to Connacht at present, should that be needed to determine the qualifiers. "The strongest possible available squad will be named this week," says Lam. " We are back at the Sportsground, this is do or die for us in this competition, so we will be putting the strongest possible side out to win the game, and win the game well - and more importantly by performing well. "This is the Challenge Cup and we set a goal to get through to the next stage. On the back of the poor performance last week, we are not in. We would have qualified if we had won, so the simple equation is we need five points - and that still doesn't guarantee us - but it does give us the best possible chance, and that is all we can control." Henshaw is expected to slot into the No 13 jersey alongside Bundee Aki, while scrumhalf Kieran Marmion is also returning after a hip pointer. Connacht will still be missing fullback Darragh Leader who is expected to be out for the reminder of the season after aggravating an old hand injury when playing for the Eagles on Saturday. Returning No 8 Eoin McKeon also suffered a hip pointer playing for the Eagles, while Jason-Harris Wright suffered concussion early in the Brive game and is following return to play protocols. Craig Ronaldson remains sidelined with a shoulder injury. After the 21-18 loss in France, Lam says Connacht now need to concentrate on the "mental" aspects of winning. "We are in the second half of the season, and the biggest learning for us is, yes, all our skills have improved, the game plan is really solid, and we know it can win games for us, the guys are in good condition, and we are now down to the mental side of things - to be able to move on when you make mistakes. "We went from one mistake to the next mistake and it's about being really honest with our preparation. I have spoken to a few players and it's fair to say some were disappointed with their preparation - maybe not as focused as it would have been - and that to me is a great outcome, with players being honest about their prep." Despite Connacht's comfortable win in freezing conditions in Siberia, the Russians have proven their credibility in the competition with wins over both Newcastle and Brive. "They will be no pushovers," says Lam. " and if we do not prepare well [this week], and give them the respect they deserve, to get five points is going to be the challenge. They are big men, played some really good rugby,so we do not underestimate them." Although visibly angry after Connacht's performance in France, Lam says Connacht have come a long way. "It is now pushing the one per cents if you like. It has been a tremendous learning for all of us at a crucial time. We have been through injury crisis, the whole Russia thing, and this is another hurdle, another big lesson that will hopefully help us get through." "I had an honest discussion with every goalkicker in our pro squad. It is the difference between winning and losing games, so my expectation of the chosen goalkicker is 100 per cent. "So we are putting more acid on our goal kickers, and we have seen the difference when we nail our kicks. We started the season with our kick over the 80 per cent mark and we have dropped right down to the 50 per cent make, which is not good enough." Five kicks were missed in France, while Brive centre Thomas Laranjeira was the hero of the evening, firing over seven from eight - the match winner in injury-time to give the French side a 21-18 win. It was a dramatic defeat at Stade Amedee-Domenech after Connacht had scored three tries in this round five fixture. "[We] just handed it on a plate through our mistakes," said Lam. "Individual errors were horrendous, and all we can say is that it is just not a Connacht performance, and that is what is disappointing." 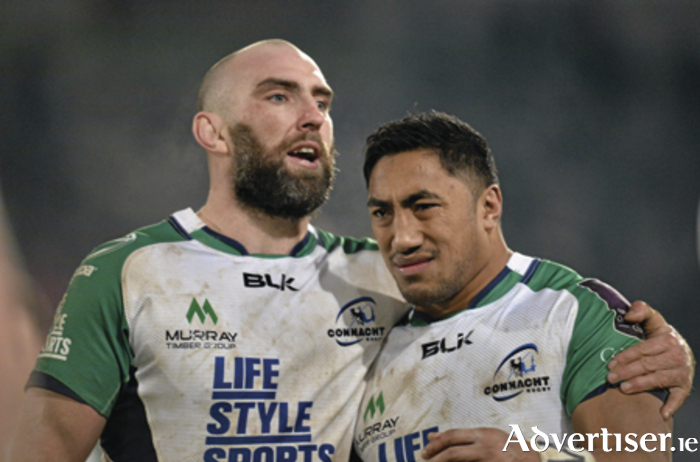 Captain John Muldoon looked to have secured victory with a 78th minute try, but on a night when kicking prowess seemed to dessert Connacht's marksmen, replacement outhalf Jack Carty missed the resulting conversion, levelling the score 18-18 a minute from time. And from the resulting restart, a Connacht knock-on provided the home side with the platform, and after three scrum re-sets, the penalty duly arrived with centre Thomas Laranjeira striking his seventh through the uprights to take victory. Minutes earlier it had looked like the perfect finish to what had started so well when Danie Poolman, in securing possession from the kick off, set up territory for Rory Parata to claim the opening try after just 45 seconds. MacGinty missed the conversion, while Laranjeira kicked his first penalty after Brive started making inroads through their pack. MacGinty was again just wide from 30 metres with a second effort, while Laranjeira had no difficulty converting two more by the 27th minute. As Connacht struggled to keep possession and establish territorial control, they did well to withstand two rolling mauls, and were let off the hook when Laranjeira missed a fourth penalty at the end of a first half Lam described as the "worst 40 minutes I have seen". Connacht upped their efforts, immediately reducing the arrears through MacGinty's boot, but once again Laranjeira counterered from a scrum. However Connacht were rewarded when they found some rhythm with ball in hand. Ultan Dillane was adjudged to have lost possession on the line, but within minutes Muldoon crossed for his first in the 53rd minute after a patient build-up, MacGinty's conversion hitting the upright. Brive continued to live off penalties and Laranjeira answered the call, adding six more points for an 18-13 lead before Carty was inches wide with a 74th minute penalty. However when Muldoon struck for his second try, few would have bet against Connacht at that stage. But with "error after error ", Connacht conceded again, allowing Laranjeira to strike at the death. Connacht: T O'Halloran, D Poolman, R Parata, B Aki, M Healy, Aj MacGinty, I Porter, R Loughney, J Harris-Wright, R Ah You, A Muldowney, U Dillane, J Muldoon (cpt ), J Connolly, S O'Brien. Replacements T McCartney for Harris-Wright (28m ), D Buckley for Loughney (47m ), J Carty for Aki (54 ), S O'Brien for Masterson (58 ), C Blade for Porter (59 ), F Bealham for Ah You and G Naoupu for Connolly (69 ). Referee: C Maxwell-Keys (England ).